Originally posted: August 19, 2016 . Last modified: April 17, 2019 . Key Lime Fudge is unlike any other fudge. It’s sweet, tart, soft, smooth, and so creamy you’ll love to eat it! A few years ago, John and I took a trip to Key West, and it quickly became my absolute favorite vacation spot. While we were visiting the island, we found this neat little novelty shop selling everything key lime. The store is Kermit’s Key Lime, and it is the only place I’ve found key lime fudge. Kermit’s Key Lime Fudge had me hooked after one bite. It comes in a cute box with a wooden spoon which I found odd at first. Then I realized you need the spoon to eat it because the fudge is so soft that it’s nearly impossible to cut into squares. Every time we visit Key West I find myself at Kermit’s buying a box of key lime fudge with the best intentions of taking it home. Only it doesn’t make it that far. It usually gets eaten before we leave the island. Recreating Kermit’s Key Lime Fudge has been a goal of mine for a while now, but I haven’t been able to find real key lime juice. There are a couple of companies that sell it online, but the shipping was as much as a bottle of the juice. Recently I found a bottle of key lime juice at my local supermarket and bought it without hesitation and got to work. You may be wondering why I didn’t use regular lime juice. That would have been easier since limes are in practically every grocery store. If you’ve never tasted a key lime, you don’t know what you’re missing. Key limes are smaller in size, more tart, and have a stronger aroma than Persian limes. They make the best key lime pies, fudge, cocktails, and key lime aiolis.. I higher recommend trying to find a bottle of key lime juice for this recipe. You’ll be happy you did! Place parchment paper in a 9 x 9-inch baking dish and spray the parchment paper with cooking spray. Set aside. Heat the chocolate chips and sweetened condensed milk over low to medium heat stirring constantly. After the mixture melts, remove from the heat and add the lime juice. Stir to combine. Carefully pour the fudge into the prepared baking dish. 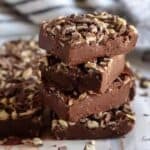 Place the fudge in the refrigerator for 3 to 4 hours. If you need to cut it into squares, let the fudge chill overnight. Place a sharp knife under hot water to warm the blade before cutting. Store in an airtight container in the refrigerator for up to 5 days. If you like this fudge recipe, please leave us a comment and rate the recipe card. You can also find us on Facebook, Pinterest, Twitter and Instagram searching for Berly’s Kitchen! Key Lime Fudge is unlike any other fudge. It's sweet, tart, soft, smooth, and so creamy you'll love to eat it! Prepare a 9 x 9-inch baking dish with parchment paper. Spray parchment paper with cooking spray. Add white chocolate chips and sweetened condensed milk to a large saucepan, and melt over low-medium heat. Stir until the mixture begins to melt and combine. The mixture may be thick but will loosen once the key lime juice is added. Add the key lime juice, and stir to combine. The mixture should be smooth and creamy. Pour into a prepared baking dish. Place in the refrigerator for 3-4 hours to set. *See post regarding serving and cutting options. *Total time includes time for fudge to set. My two favorite things- fudge and Key Lime. Thank you for sharing this!! Thanks, Anna-Marie! This recipe is a favorite. My husband loves key line pie and I can’t stand it, so we never make it, haha! With valentines day around the corner I might have to make him some of these delights, he will LOVE them! I love key lime anything, so this sounds amazing! Yum, can’t wait to try it! Thank you, Leah! Me too! One of my favorite places is Kermit’s Key Lime Shop in Key West. Everytime we go to the Keys, we have to visit Kermit’s lol! Ooh what a fab combo. Yummy! Yum! Key Lime Fudge sounds delicious. A great new twist on one of my favorite treats. I’m looking forward to mixing up a batch soon. Thanks for sharing. I lovvvvvvve key lime!! Tis fudge is a MUST make!! 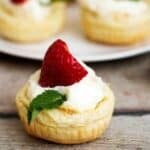 This was perfect timing for me, my hubs loved the Mini Key Lime Pies that I made him and I’m sure he would love this as well! Wow, this sounds scrumptious. What a great idea for a fudge flavor!